Royalty in Purple and Chrome! Dressed to the nines in the finest of fine! The King Chromo Skin can be used on the Chrome MonstroBot. The weapon's stats (power, power bonus, attraction bonus, etc.) are not changed. The King Chromo Skin can be purchased from the King's Arms Trapsmith or King's Cart in exchange for 150 King's Credits. The King Chromo Skin cannot be traded on the Marketplace or through Give To Friends. 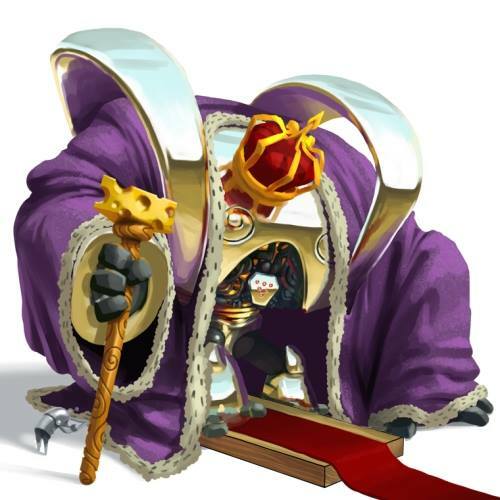 25 November 2013: The King Chromo Skin was introduced during the King's Giveaway (2013). This page was last edited on 24 January 2018, at 13:42.